The Mayflower brought some stalwart, devout, and admirable men to America in 1620. It also brought John Billington. Susan Page Davis here. Last month I told you about my ancestor, John Alden. Today I’ll tell my husband’s family’s side of the story. Problems with John began on the voyage. He and his wife, Elinor, embarked with their two sons, John Jr. and Francis. 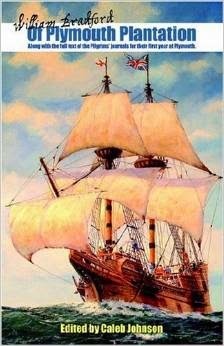 The boys were about ages 15 and 13 when the Mayflower sailed. Like John Alden, Billington was a Stranger, one of the passengers who was not part of the Separatist group on the Mayflower. Bradford described the Billington family as far from pious, being “one of the profanest families amongst them.” Some sources say John Billington left England to escape his creditors. On board the ship, John was disliked for his foul language and the escapades of his sons. Francis endangered all aboard when he fired a gun inside the ship, near an open keg of gunpowder. 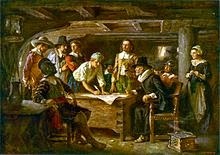 Though the father was already known as a troublemaker and implicated in a near mutiny on board, he did sign the Mayflower Compact when they anchored. On shore, Billington did not endear himself to the other colonists. He meddled where he pleased and disobeyed orders from the group’s military captain, Miles Standish. On several occasions, he publicly insulted Standish. In 1622, he was found guilty after he “showed contempt of the Captain’s lawful command with several speeches.” His sentence was to have his head and heels tied together for a period of time, but after he apologized, this punishment was stayed. Elinor, known as a gossip, was later put in the stocks and whipped for slander. During the first winter, the cruel weather and lack of provisions contributed to the death of half the colonists, reducing their number to fifty. The Billington family was the only one that survived without losing at least one member. In 1624, a scandal rocked the Plymouth Colony. Several people revolted against the rule of the Plymouth church, led by a minister who arrived on the ship Charity, John Lyford. Lyford was loyal to the Church of England, not the Separatists, and apparently sent letters to England to undermine the Plymouth Colony and the authority of Governor Bradford. John Billington was named among Lyford’s supporters. However, Billington insisted he was innocent and was never officially punished. Lyford was banished from the colony. His real claim to fame—or infamy—came in 1630. 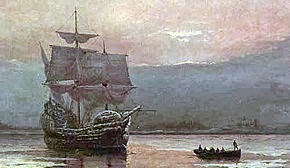 By this time, many other ships had brought new colonists, and the Massachusetts Bay Colony was also growing at Boston. A young man who arrived about 1624, John Newcomen, got in the bad graces of Billington and several others who were now landowners, by poaching on their property. Apparently, this was a matter of contention for some time, and he had been repeatedly warned against it. As Bradford recorded it, Billington waylaid Newcomen in the woods “about a former quarrel and shot him with a gun, whereof he died.” Other sources tell us Newcomen hid behind a tree when Billington accosted him. Primary sources are few, but most accounts say Billington shot him in the shoulder and that Newcomen lingered several days. Infection set in, and he died. 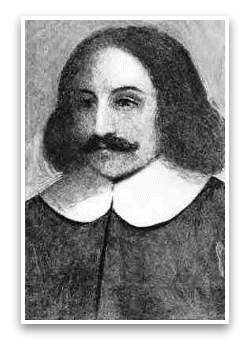 Some modern descendants have tried to defend John Billington, saying that William Bradford had it in for him from the start. There may be something to that, but the authorities at Plymouth did call in John Winthrop of Massachusetts Bay and others to help them make the right decision, as there was some question as to whether the colonists had jurisdiction to carry out a death sentence. John Billington was hung in September, 1630. He was the first white man convicted of murder and hung in New England. John Jr. was already dead at the time of his father’s execution. The younger son, Francis Billington, married Christian Penn Eaton, also a Mayflower passenger, in 1634, and they had nine children. Francis apparently overcame the family stigma and became an upright member of the community. It is from Francis and Christian that my husband is descended. To enter a drawing for a paperback or e-book copy of Susan's Colonial-era novel, The Prisoner's Wife, leave a comment with your contact information below. How amazing to trace your family back to such an historic period & happening. Thanks, Mary! I wish I could trace all my lines back this far, but I have a lot of blank spaces on the chart that I just know are people with fascinating stories. It makes history come alive so much more when it's YOUR story. amazing! My husband loves that he can claim this notorious man in his family. When I started doing genealogy, my mother had no idea she was a John Alden descendant. Someone in my husband's family had found the Billington line. Thank you for sharing another Mayflower ancestor. As I read your statement that Francis overcame the stigma of his father's actions, it made me realize that most families have some deed or fact that has to be overcome. None of us are immune to misdeeds of the past but we can't let them rule our future. I love your historical posts and I appreciate your book giveaway. Thank you, Connie. I think you're right--we are amused by our far-removed ancestors and their misdeeds (even crimes), but if you are in the next generation or two, it is not so funny. Thank you for sharing the stories of your ancestors. I think it interesting to know where you come from. I have limited information about my family history and wish I knew more. Thank you for the chance to win a copy of your book. You're welcome, Susan! Most of my ancestors came from the British Isles and Channel islands and settled in New England. It is a lot easier when your people came early and stayed in the same area. I'm also related to John Billington. He was an interesting character. Well, hello there, cousin-by-marriage! We took our kids to Plimouth Plantation once, and it was wonderful. My husband had an interesting conversation with man re-enacting Elder Brewster. He was very concerned about John Billington's soul and asked if we were related to him. My husband assured him, "VERY distantly." Super that we're related even if it is through a criminal. LOL! Small world too, as I am also related through Francis's side. Thanks heavens he redeemed the family. I love your posts, Susan! Such interesting family history you and your husband have! Thank you for sharing. A few rogues in your closet can be good conversation starters. But the heroes are nice additions too. Haven't found any skeletons in my family closet yet. One ancestor was groomsman for the king's mother in seventeenth century France. What a story, they were scroundrels for sure, I am surprised that Francis went on to do so well coming from that family. I have tried to do some history on our family but it is daunting looking on the website and seeing so many with same names. I look forward to reading about the Prisoners wife, thanks for sharing. It can be confusing, especially with the men's names. They didn't use nearly so many in the old days. But it's a very satisfying hobby, Paula. I always love your interesting posts, Susan. Thank you for sharing! You're welcome, Melanie. Thanks for coming by! Yes, he was, Sharon. The whole bunch of them were scalawags.